Six complete expansions for the award-winning 2-player card game of discovery, settlement, conflict, and trade! Share a theme with your clever opponent or design your own expansion deck! Now you can expand your principality in new directions! Each of the 6 expansion sets feature a different theme to enhance the flavor of your Catan Card Game experience. 205 New Cards! Expansions set includes: Knights & Merchants: Conflict and trade wars threaten! Will it be victory by spice or sword? Six complete expansions for the award-winning 2-player card game of discovery, settlement, conflict, and trade! Share a theme with your clever opponent or design your own expansion deck! Now you can expand your principality in new directions! 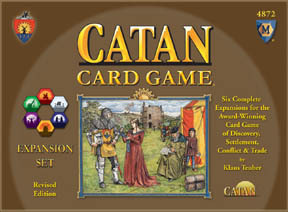 Each of the 6 expansion sets feature a different theme to enhance the flavor of your Catan Card Game experience. 205 New Cards! Expansions set includes: Knights & Merchants: Conflict and trade wars threaten! Will it be victory by spice or sword? Science & Progress: Technology and invention are the keys to the future! Will you embrace machines or build a university? Wizards & Dragons: Magic bursts into Catan! Mighty wizards with potent spells can change the face of the land itself! Barbarians & Traders: Exotic goods spawn dreams of warehouses, which some would rather pillage than purchase! Politics & Intrigue: Your secret plans bear fruit! Can you seize control through treachery, coin, dogma, or diplomacy? Trade & Change: Commerce and exchange are powerful tools! Why hire knights when your workshops provide all the resources you desire? The base game is enough, to be quite honest, yet this and two other expansions now exist for the game. I own this with the Barbarians & Traders upgrade kit, and for some it might be splendid to put it all together, may not be necessary. In summary, it's not really my thing, but it IS well done, and the right kind of player could get very addicted to this game (+ expansions).